perceptionsense: What is Synsepalum Dulcificum? Synsepalum Dulcificum... the name of this fruit is extremely difficult to pronounce, but it is simply the scientific name for the Miracle Berry. 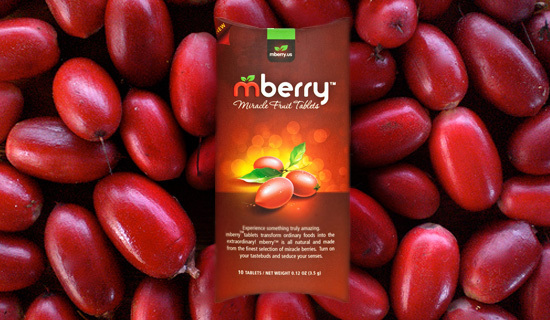 The Miracle Berry was discovered in West Africa and immediately after it coined the name "Miracle Berry" because of it's strange effects. Inside this small West African berry, is a thick pulp which contains a glycoprotein called Miraculin. This "taste-altering" protein was researched because of the berry's ability to alter your taste buds. Miraculously, the protein Miraculin makes sours things sweet. How does it work? The protein Miraculin, resides within the pulp of the fruit and as it is consumed the protein binds to all of the 10,000 taste buds that are on the tongue. Within each taste bud are around 50-100 taste cells. Transduction of the taste buds occurs when chemicals are in contact with the receptor sites located on the tips of taste cells. The electrical signals produced are then transmitted from the tongue to multiple nerves, ending up to the thalamus and the frontal lobe. This being a part of processing after the receptors are activated. As the Miraculin coats each taste bud, when a stimulus is introduced it actually alters the shape of the taste bud and only allows the receptors to identify acids as sugars which temporarily changes perception. This small pill or berry has the ability to physically alter the stages within perception by altering the input which then sends different signals to be processed within the brain. It changes sours to sweets, sweets to either the same or even sweeter, and does not alter any other taste perception. These berries or now sold in pill form which both are legal, sold in the US and extremely affordable. Today, it is known to aid in the taking of bad-tasting medications or dieting. Give them a try and trick your taste buds!